Maybe we shouldn’t take our daily corporate samples too seriously. Maybe they don’t adequately represent the global economy. So IBM’s revenues last quarter plunged 13% from a year ago. It blamed China and the dollar, among other culprits. But IBM’s revenues have dropped for 13 quarters in a row. It’s a normal IBM condition and not a reflection of the global economy. A whole slew of other tech companies chimed in with either disappointing revenues or disappointing outlooks, or both, each blaming a variety of issues, among them China and the dollar. Chip maker Qualcomm just reported a 14% plunge in its quarterly revenues. It’s having trouble in the smartphone market and will lay off a bunch of people. But maybe they’re just running into tougher competitors, rather than a lousy global economy. And the PC business, which is cratering, is dragging down all those involved. That’s structural and has little to do with the state of the global economy. Then there’s industrial giant United Technology which reported that its revenues last quarter dropped 5%. Today Caterpillar reported that global machine sales plunged 15% in June compared to a year ago, after having dropped 12% in May and 11% in April, In Asia, machine sales plunged 19%, in Latin America 50%. And in booming North America? Down 5%, after having been up for the prior two months. So CAT is facing Japanese, Chinese, and German competitors. It’s having to slug it out with them in China precisely when China is slowing. So it may be just CAT that’s having a hard time. But don’t look at energy. Energy is getting clobbered…. So maybe we’re cherry-picking negative data. There are companies with actual revenue increases and positive outlooks, like Equifax, the credit bureau, which just reported a 10% jump in revenues (14% “in local currency,” as it says). Consumer borrowing is king, and Equifax expedites the process. Turns out, global trade during the quarter and during the first five months of the year experienced the sharpest drop-off since the Financial Crisis. 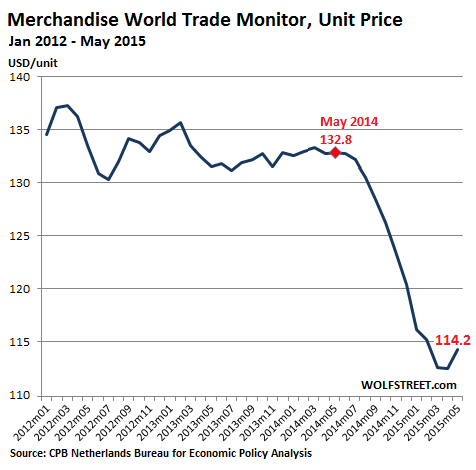 The CPB Netherlands Bureau for Economic Policy Analysis, a division of the Ministry of Economic Affairs, just released its latest Merchandise World Trade Monitor, which covers global import and export volumes. It was dreary. 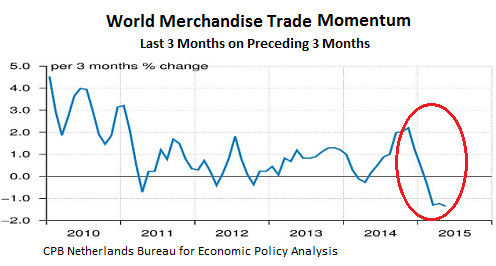 World trade shrank 1.2% in May from the previous month. The index fell to 135.1, the lowest level since July 2014, having dropped nearly every month so far this year. It’s down 4.7 points from its peak in December, the sharpest and longest decline since the Financial Crisis. That trade momentum measure slumped 1.3% in May, after having dropped 1.2% in April. It now amounts to the most negative “momentum” since the Financial Crisis. This isn’t stagnation or sluggish growth. 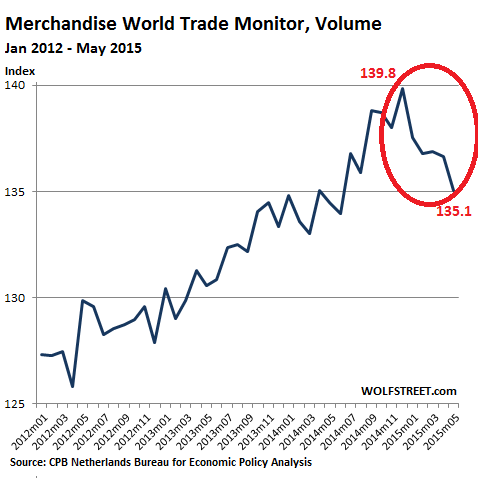 This is the steepest and longest decline in world trade since the Financial Crisis. Unless a miracle happened in June, and miracles are becoming exceedingly scarce in this sector, world trade will have experienced its first back-to-back quarterly contraction since 2009. Both of the measures above track import and export volumes. As volumes have been skidding, new shipping capacity has been bursting on the scene in what has become a brutal fight for market share [read… Container Carriers Wage Price War to Form Global Shipping Oligopoly]. Hence pricing per unit, in US dollars, has plunged 14% since May 2014, and nearly 20% since the peak in March 2011. For the months of March, April, and May, the unit price index has hit levels not seen since mid-2009. The decline was widespread, import and export volumes decreasing in most regions and countries, both advanced and emerging. Import and export growth turned heavily negative in Japan. Among emerging economies, Central and Eastern Europe was one of the worst performers. Given these trends, the crummy performance of our heavily internationalized revenue-challenged corporate heroes is starting to make sense: it’s tough out there. Don’t worry Wolf, governments around the world will lower interest rates and provide lots of stimulus. We’ll get through this with no stress. Confidence cannot be stimulated with fiat currency. Once the confidence is lost, the interest rates would lose its meaning immediately. Interest rates are near 0. How do the central banks stimulate the economy with no tools in the tool box? World trade shrinking may usher in currency devaluations to revive the economies (mfg, commodity, etc) vis boosting the export which in turn may bring about trade war and prelude to real war. Beginning with Britain in September 1931, currencies around the world were devalued. The British pound was the world’s premier international currency at the time, and also the premier “reserve currency” in the sense that other central banks held British government bonds as reserve assets. By some measures, this was a success: industrial production indeed improved in many countries, after they devalued their currency. Vespa, If I remember correctly, that exercise didn’t end all that well. Sure hope we can avoid the same outcome. I thought one of the big selling points of the globalization scheme was that countries locked in trade relationships would never go to war. Really hope that is true. Hey guys, it’s tough out there. Wear a cup. My experience is mostly limited to Europe and Japan but I can tell you a few things. This year, after many years of working with me, my oldest and most trusted contractor, headquartered in Osaka, asked to be paid in US dollars instead of yen or euro in return for a hefty rebate. The discount more or less offset currency carry and, given I’ve worked with these people for years with maximum satisfaction, the deal went through and it’s going nicely… for the moment. Another Japanese supplier I occasionally use offered the same deal on some parts I urgently needed back in April: US dollars in return for a hefty rebate. Never before have Japanese companies behaved like this: while Japanese firms in general tend to have a pretty low opinion of local politicians, this is the first time in my memory they seem to have lost faith in their own currency as well as in the euro. They are hoarding US dollars like there’s no tomorrow. Another telling fact is German exports. They peaked in 2006-2007, slided in 2008-2009, picked up again in 2011 but never went back to the dazzling 2007 heights and refuse to grow. It’s easy to see what went wrong here: three of Germany’s premium export markets (France, Italy and Spain) have never recovered and, in spite of massive credit expansions aimed at fostering more bubbles, see their fundamentals (savings, unemployment, real wages etc) deteriorate steadily. German firms have hence shifted their model towards the US and Australia. I’ll give you an example here so you can understand how things work. In 2013 BMW Motorrad, the motorcycle division of BMW Group AG, introduced a model family based around a water cooled version of their iconic boxer engine. Despite tremendous demand from all markets, these models have been chiefly earmarked for the US and Australian markets. European dealers are left starved (waiting times over four months are very common) while US and Australian dealerships have lines of these bikes on the floor ready for delivery. BMW maintains their US and Australian dealerships must have a “minimum stock” which is denied to their former main breadwinners. Finally a look closer to home. In my area a Mainland Chinese group opened a number of big box stores. They carry pretty much every conceivable household item, from buckets to lightbulbs. These stores are huge and shiny new. As you expect, prices are ridiculously cheap: even if it’s a branded item, as long as it’s made in China, you can expect to pay a pittance for it. Just to give an example I bought a couple of Osram lightbulbs (obviously made in the Celestial Kingdom) and paid for them half as much as anywhere else. VAT included. Their warehouses are immense and literally bursting at the seams. As I walked away with my bulbs, I could not but think that the much dreaded “China dumping” has already started, only nobody pays attention because it’s not in “strategic” sectors such as steel and glass. I paid €2.90 for my bulbs. Take away 22% VAT and you are left with €2.62. Take away the taxes the Chinese group has to pay, utilities, wages, custom duties, the cost of shipping them over from China and just how much did these thing cost when they left Shanghai? Your comment on Japanese companies hoarding dollars is fascinating. Wonder how widespread that is. I would assume your suppliers are smaller companies. BTW, I’m surprised you’re still able/allowed to buy incandescent light bulbs (I assume that’s what your Osram bulbs were). Here in the US, they’re been banned. First we had to buy the horrible florescent bulbs that everyone hated, but now the LEDs are available and increasingly affordable, and they’re great. Yes, these are smaller, family owned firms. But Japanese firms are on a roll: earlier this year Hitachi had the fire sale of a litetime on the European market. Yamabiko has continuous “promotions” (really barely hidden price cuts) to shift metal. Incandescent bulbs are theoretically banned but manufacturers got around the ban by simply filling their bulbs with iodine and bromine, changing the filament shape and branding them as “energy saving halogen”, a contradiction in terms. Nudge nudge, wink wink. Nothing unusual about Japanese companies hoarding dollars. They need to pay their debts back in dollars and hoarding dollars is way cheaper than purchasing them from the bank. I think almost all of this is related to depressed oil prices. Oil is the #1 global business, and when you artificially depress oil prices (as Saudi has done since 2014), your global energy-revenue trends (a significant % of revenue) will fall in the short term. In the long term, cheap oil (and cheap money, and cheap commodities) will help sustain modest GDP growth. Look for the “merchandise curve” to remain depressed until oil returns to trend. And it -will- return to trend, as it has predictably for 100 years (trend being in the neighborhood of $90/bbl today, slightly less is Iran starts trading oil again). Barring some economic melt-down, oil demand will remain on the same up-slope it has for the last 50 years. Artificially depressed oil prices? The Saudis have merely continued to pump oil at their normal rates. Cutting back on production would ‘artificially’ buoy oil prices by reflecting an ‘artificially’ limited supply. Depressed oil prices are a reflection of genuine demand destruction worldwide. The Chinese economy is sputtering, and Europe is stagnant. The fact that oil prices have crashed more than 50% within the past year refutes your claim that oil demand will remain on the up-slope. The end of cheap oil is here, and we can’t afford to extract what’s left. In 2010, the world was using around 87mb/day. Today, we’re at roughly 93mb/day, and demand continues to grow at around 1mb/day/yr. The global population is going to grow from 7B to 9.5B in the next 30 years. The number of ICE vehicles will increase from around 600M today to 1B in 2040. Feedstock oil demand will continue to grow for 30 years (food, medicine, plastics, etc.) EVs will become 50% of all new vehicles sold roughly around 2032-2035, but ICEs oil demand growth will continue through 2040s. Finally, the point at which global oil profits are shareholder-maximized (and stabilized) is roughly $80-90/bbl today, and growing at roughly 8% per year. We reached “economic peak oil” around 2000. Simply observe the price of oil from 2001 thru 2014, rising at 14% per year, y-o-y. This is our normal actuarial-maximization trend. Today’s prices are entirely artificial due to Saudi over-supply, which is profoundly reducing global oil profits. It can’t last. Oil will return to trend (as it always has historically) and continue on its normal slope. As oil prices remain depressed (along with cheap money and cheap commodities), global GDPs will benefit, though debt will dampen growth. Expect 3.3% global GDP growth in 2015, with higher growth in the years to come. I went to my local mall last week to get a battery for my watch, otherwise I wouldn’t have gone. While there I went into a women’s clothing store, a big chain store, because it was having a 40% off sale, the entire store. It is very very unusual to see a sale like this during the week or when it’s not a holiday. Otherwise this is the type of sale that only happens when a store is liquidating. I didn’t buy any thing except the battery. I think this anecdote summarizes the economy on main street. I did some cursory research looking at recent financials from Komatsu and Hitachi Construction to see if CAT’s falling revenues are merely Komatsu’s and Hitachi’s increased revenues. The Japanese are definitely not suffering like CAT, but their sales are not commensurate with a simple shift by purchasers. I think demand really is down. We have confirmation of this from the natural resources sector. Copper demand has fallen off a cliff. But global GDP remains stable (3.4%) and global oil demand remains roughly on long-trend. Clearly, low oil prices are the reason for the big “trade value” drop. The trade value drop dates coincide precisely with oil price drop dates. It is interestingto note here that demand depends on credit and debts contribute to the loss of ability to borrow significantly. were running everything with temps.